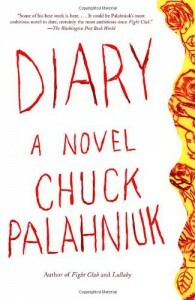 I last read Diary when I was around 16 years old and thought Chuck Palahniuk was God's greatest gift to the literary world. I devoured every book he wrote and thought he was so clever, so disgusting, and so bizarre, all in the best way possible. Needless to say my reading tastes have changed a lot in the past seven years, so over the past few years I've been rereading most of Palahniuk's novels and seeing how I like them now. I'll admit there are some Palahniuk books I'm not so fond of anymore, but I'm happy to report I still really like Diary. It's pretty different from his standard fare -- it's told from a woman's point of view, and it doesn't rely heavily on a huge plot twist -- but it's still without a doubt a Palahniuk book. This story is told through a series of diary entries written by Misty Wilmot, chronicling her life for her comatose husband after his failed suicide attempt. Detailing the plot more than that is complicated. The book certainly tells a fascinating story, but this book is more than a story. At its core, this book is a journey through the mind of an artist, and I feel like I got a glimpse into Palahniuk's creative process through reading this. Since I don't want to talk too much about the book itself, I'll post some of my favorite quotations, because if this book is anything it's quoteable. "What you don't understand you can make mean anything." "You have endless ways you can commit suicide without dying dying." "You're always haunted by the idea that you're wasting your life.